What you want is absolutely attainable with the right energy behind it! Your results affect your beliefs. MY GOODNESS, what is a person to do with this type of cycle? You might even have tried The Law of Attraction, and that didn’t work. Maybe you dabbled with vision boards, and that was unsuccessful. You may have journeyed down the path of I am declarations, and that was ineffective. Your subconscious mind has to believe you first. “I have no control over that little voice in my head,” you might say. Subconsciously, this is a belief you hold to be true. Did you know that any belief you hold true and no longer serves you can be transformed with ease and grace? By formulating a statement that your mind actually believes, because it is true. Empowering questions do just that. The Empowering Process is a book written to help you with this. 366 questions that are absolutely true written just for you. Find one that resonates for you. Read one every day of the year and focus on it throughout the day. Take the time to understand what the question is driving you toward and embrace the moment. 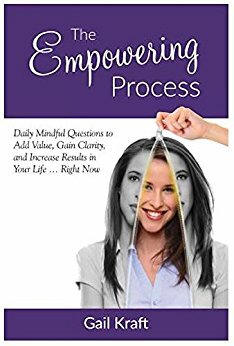 Read The Empowering Process and learn how to work on creating your own empowering questions. Grab a copy and hold on! After stepping out of the corporate world and into the role of personal coach and strategist, Gail became even more aware of what women were dealing with in their day-to-day life. Authentic Women Have It All was written to illustrated for women how compromising their uniquely feminine values cheat themselves and the world of their gifts and capabilities. The values of relationship, caring and doing the right thing, and of long term planning is needed in both family and business today. In her book Gail argues, without the female perspective, business is looking at an inescapable downfall. Wouldn’t the world be just a little bit better if we learned to uncover who we are and truly knew what gifts we have to contribute? Would our lives be a little richer if we could be truthful with ourselves and make decisions that have purpose? Wouldn’t your world be a little more robust if you knew a woman of integrity, of clarity, of authenticity? 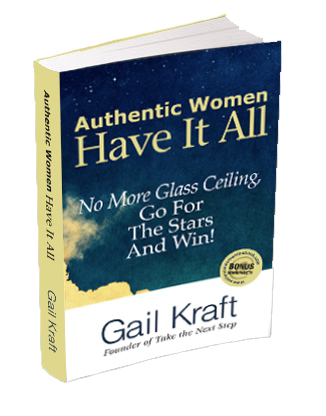 Read Authentic Women Have it All and learn how to work stepping into your truth and living the life of integrity you were meant to lead right now.